My waitress's uniform. Complete with a starched collar! My lab coat... ugh...need I say more? Much as I admire the style on other women, on me a white shirt feels drab, dreary and downright frumpy. I feel like the white of the shirt makes my dark spots darker, my eye circles darker, my lips paler my eyes duller. In short, nothing good happens! Having said all of that, this year I'm on a mission to shop less and focus on developing my personal style further. I'm experimenting with pieces I already own. I'm re-working my (unworn) classics as well as my trusty old friends. DISCLAIMER: I'm not going to pretend I don't still LOVE a real 'shopping trip' and won't be giving them up any time soon. BUT going on a shopping trip doesn't really mean doing a lot of shopping! You can read more about how to execute and enjoy the perfect shopping trip HERE. Of course, as a style and fashion blogger, I'm still a BIG fan of following the latest trends. By following, I mean checking them out and trying to recreate them using my own pieces. I'm shopping a lot less and intend to concentrate on buying items that I know I'll be wearing for years to come. Clever items that can be re-worked and re-worn over and over. Today I'm focusing on re-wearing old clothes and adding little something 'extra' using accessories. Accessories are a brilliant way to transform pieces you already own without spending too much. Accessories, like scarves, can also be worn in multiple ways with many different outfits. I'm using layers and a pretty silk scarf to make a classic (read: BORING) white shirt feel a little less "classic"! This pretty silk scarf was kindly sent to me from a small company called Karen Hanvik. 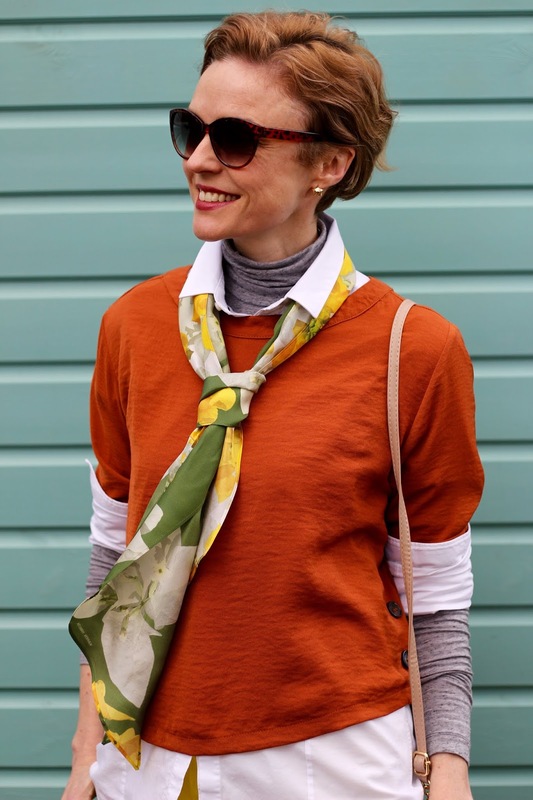 The ethos of Karen (and her brand) is to inject colour into more muted wardrobes using timeless pieces that will never date. The scarves are made in the UK and feature floral designs that are bold and beautiful! This brand ticks lots of boxes for me. "That scarf of yours would be perfect for the silk scarf connoisseurs out there." She is spot on with that! Top quality timeless accessories are the perfect way to refresh items in your wardrobe you may be ignoring. 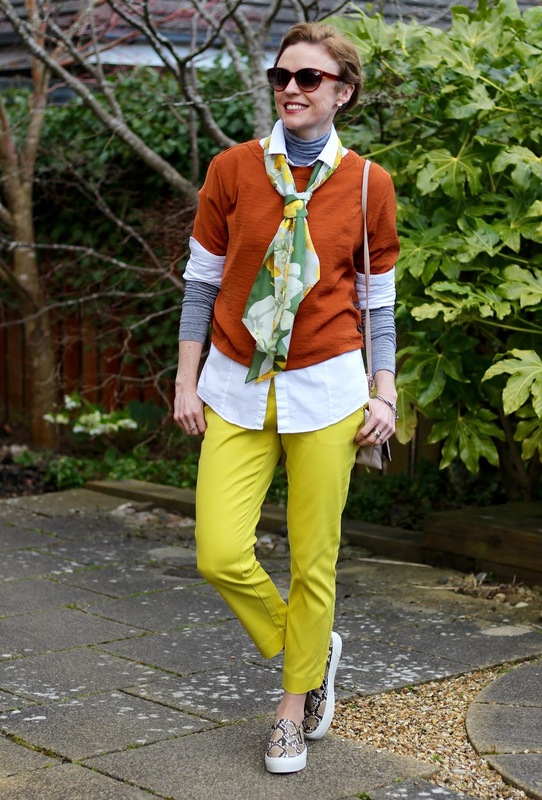 I'm styling this white shirt (yawn) with a few contrasting layers as well as my yellow trousers. 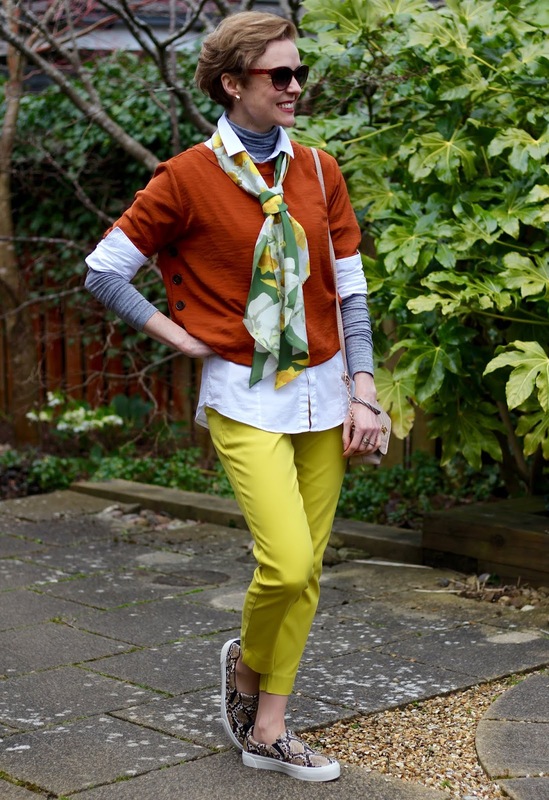 These trousers are still going strong and I know Karen's ethos is to inject colour into more muted wardrobes but there is nothing wrong with adding colour to colour. Colour is the perfect pick-me-up and I need all the help I can get! I'm just doing what I always do. It's dull and chilly here in Scotland so it's all about the thermal baselayers (top and leggings) plus sheepskin shoe liners. SHIRT: Older than time itself! AND Here are some all-white outfits that you might like... including a couple of white shirts! I love the sound of your scarves. Polka dots and leopard are ALWAYS a great buy! This is just a fabulous look, great colour-mixing, makes me happy just looking at it! I go through a white shirt every season - I like them for layering under sweaters and jackets, and like you, for popping scarves (I even have a couple of bowties and mens' ties I wear with them). I find them pretty boring on their own - I'll never be one of those chic "white shirt women" and I'm totally okay with that. 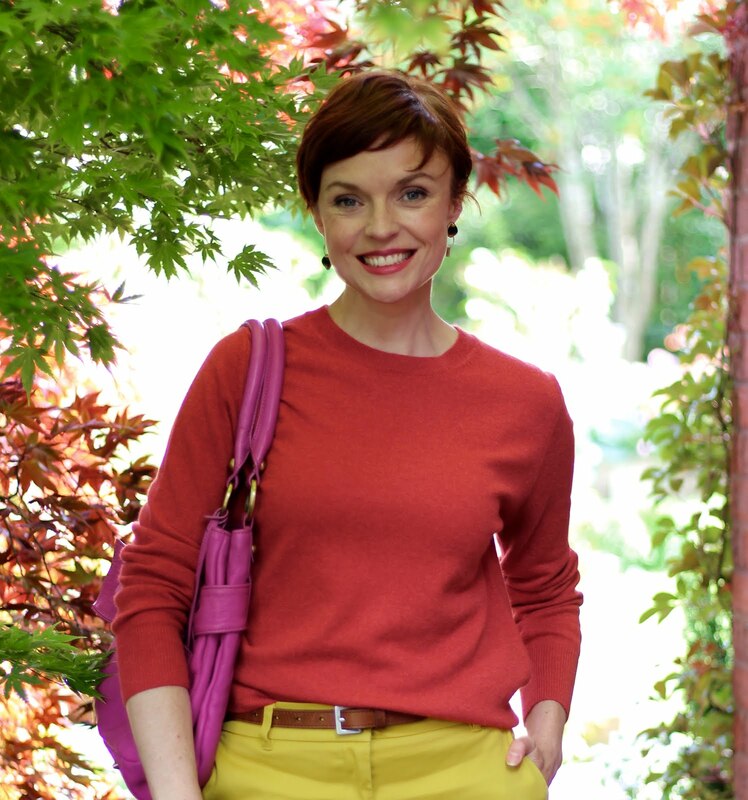 I love all these lovely citrus colours on you, Samantha! I hope it warms up for you soon! Oh I'm SO glad to hear that Sheila!! Samantha this is the most UNboring boring white shirt outfit ever... this is exactly how I want to dress every single day, the outfit (like Mary Poppins) is absolutely perfect in every way! Layering perfection, gorgeous colours, expert details. The cuffs and scarf tying is TDF. 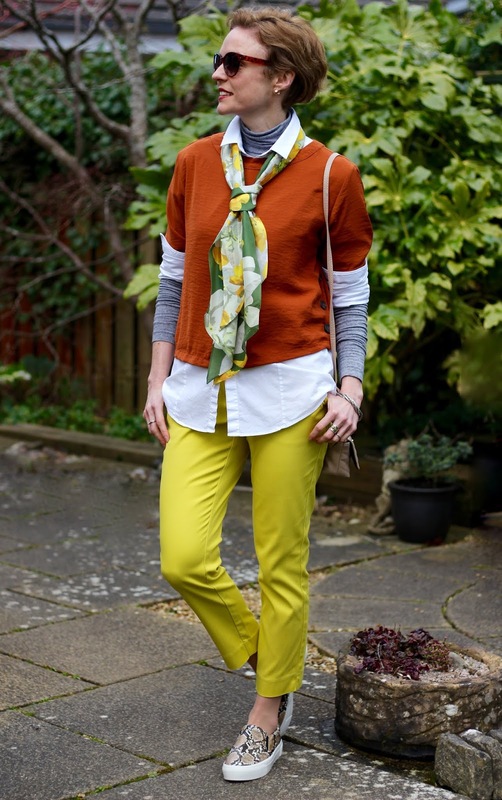 what a lovely color combo and brilliant layering, you totally rock!. I love particularly how your scarf matches your trousers!, and your cool sneakers!, your accessorizing is fab! !